We recognize the importance of protecting your privacy and our policy is designed to assist you in understanding how we collect, use and safeguard the personal information you provide to us and to assist you in making informed decisions when using our site. This policy will be continuously assessed against new technologies, organization practices and our customers’ needs. When you register for any of our events, services or newsletters you will provide us information about yourself. Similar to other commercial Web sites, our Web site does not utilizes a standard technology called “cookies” and web server log files to collect information about how our Web site is used. Information gathered through cookies and Web server logs may include the date and time of visits, the pages viewed, time spent at our Web site, and the Web sites visited just before and just after our Web site. Broadly speaking, we use personal information for purposes of administering Coronado MOAA’s activities, providing the products and services you requested, to process your payment, , to monitor the use of the service, improve our content and service offerings, and customize our site’s content, layout, services and for other lawful purposes. These uses improve our site and better tailor it to meet your needs. Furthermore, such information may be shared with others on an aggregate basis. Personally identifiable information or business information will not be shared with any parties except as required by law. This entry was posted in Who we are on 08 Apr 11 by Dave Freeman. In 2008, MOAA announced an award for outstanding performance by a Chapter. 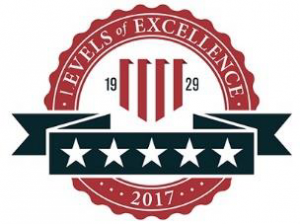 The Levels of Excellence Awards is an opportunity for chapters to be recognized in one of two categories. Five-star awards will be given to our very best chapters, and four-star awards will be presented to chapters that are doing an above average job. Each Chapter, to be considered, must submit a comprehensive review on their activities for the past year for scoring. The review must include topics such as: a) notification to National Headquarters by the Chapter of the current slate of officers, b) submission of current membership lists, c) appointment of a Legislative Affairs Officer, d) conducting a minimum of 10 events per year, including board meetings and general membership meetings, d) establishing an email point of contact, e) publishing at least six newsletters, f) a required percentage of the Board of Directors to be members of MOAA, g) conducting an active recruiting drive, h) a Personal Affairs program, i) membership in a state Council of Chapters, and other measures of Chapter performance. The submissions are judged in the late summer for the preceding year and the results announced in the fall. The Coronado Chapter was award the highest recognition of a 5-Star Chapter . The flag banner was presented by Adm Norb Ryan during a visit to a membership event held at the Windemere Hotel in September 2007. The Coronado Chapter again was recognized as a 5-Star Chapter and the 2009 banner was presented by GEN (R) USMC Neal, MOAA President presenting. Only 89 winners out of a total of 439 Chapters. We also won a Unique Communications Award in 2009 for Col Gene Fenstermacher, USAF (Ret. )-Legislative Review- the best in the West !